The Adventures of Tom Sawyer and the Adventures of Huckleberry Finn is for Ages 9-12. 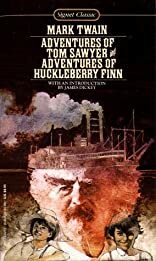 The Adventures of Tom Sawyer and the Adventures of Huckleberry Finn was written by Mark Twain. The Adventures of Tom Sawyer and the Adventures of Huckleberry Finn was published by Signet Book. Subjects of The Adventures of Tom Sawyer and the Adventures of Huckleberry Finn include Action & Adventure, Action & Adventure - General, Adventure stories (Children's/YA), Children's 9-12 - Literature - Classics / Contemporary, Classic fiction, Classic fiction (Children's/YA), Classics, Fiction, Fiction / General, JUVENILE FICTION / Action & Adventure / General, Juvenile Fiction / Classics, Literature: Classics, and Modern fiction. About James Dickey (Introduction) : James Dickey is a published author and a designer of children's books and adult books. Some of the published credits of James Dickey include Deliverance.